Situated on the beautiful island of South Uist, Frobost Lodge is ideally located for exploring the Western Isles. Set within a scattered crofting settlement, surrounded by rock-studded hills, small lochans and unspoilt beaches, the area is a paradise for artists, photographers and bird watchers. All on ground floor: Living/dining room/kitchen with tiled floor. Utility room. 2 bedrooms: 1 double, 1 twin with additional bunk. 2 wet rooms, one with toilet. Separate toilet. Underfloor CH, elec, bed linen and towels inc. Satellite TV. CD. Elec cooker. M/wave. Coin-operated w/machine and t/dryer. Freezer. Broadband. Sitting-out area. Parking (2 cars). Easy walking access. No smoking. NB: Sloping banks at the side of the property. 1st comment: It was very useful to be able to book a part week. July 2010. 2nd comment: The two lovely wet rooms, underfloor heating, warm welcome were all great. July 2010. Very tall standing stone on South Uist that dates to neolithic period. 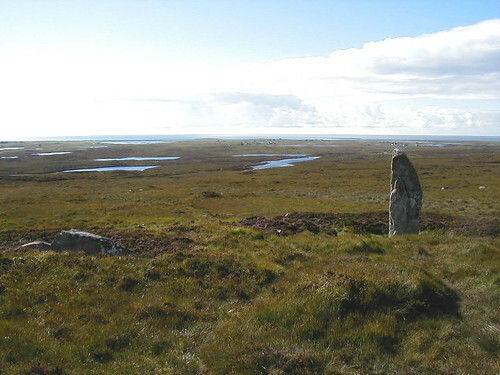 The stone rises almost 17 feet into the air which makes it one of the largest standing stones in the isles. 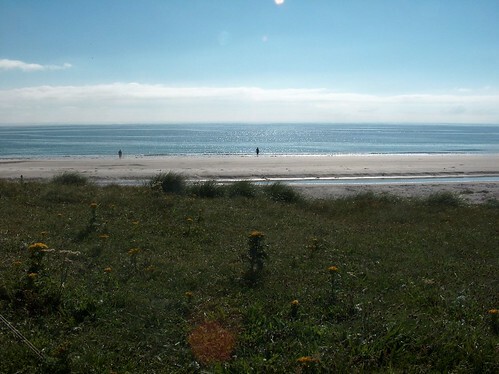 Its history is veiled in a typical hebridean mist.